After the launch of Deletable by Su, my dining companions decided to have dinner at Canton-i, in The Gardens Mid Valley. At close to 8pm, there was a long queue at the counter. We quickly took a number, and waited outside the restaurant. 30 minutes later, we finally got a table. 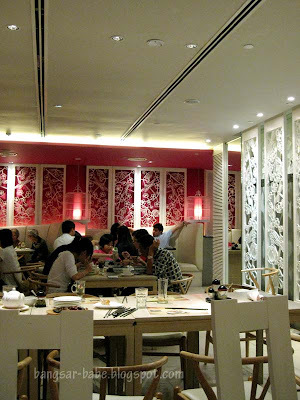 The interior is bright and decorated with cherry blossom motifs, and furnished with white tables and chairs. 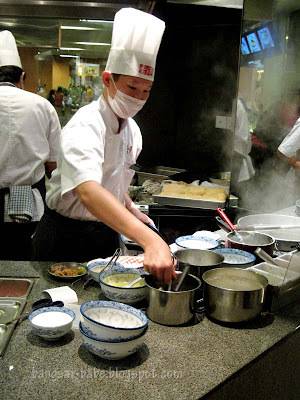 They practice an open kitchen concept, so you can watch the chefs prepare your noodles and chop the roasted meats. I found the dining space very small and the tables were placed very close to each other. So close you can actually hear the conversation from the table next door. 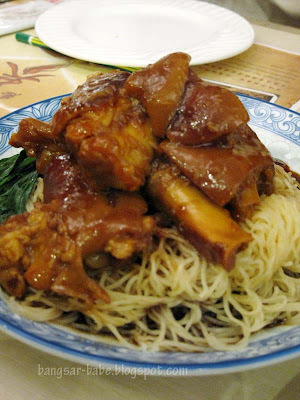 You can opt to pair your noodles with roasted chicken, duck, char siew, siew yuk or pork knuckles. I found it strange that the dry version costs RM1 more than the soup version – shouldn’t it be the other way around? 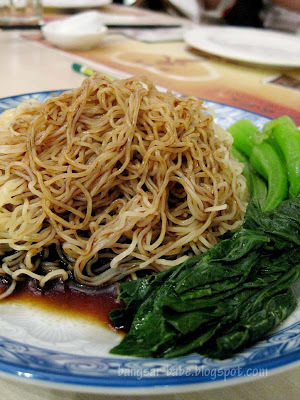 The wanton noodles (RM4 for a plain portion) had a springy and slightly crunchy texture. However, the sauce wasn’t tasty enough for me – I still prefer the wanton noodles from PJ State and Fun Kee. 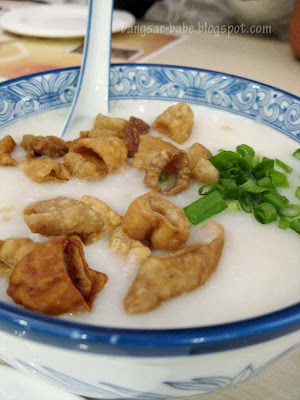 I tried a spoon of porridge with deep-fried intestines, which had a very smooth texture. It felt as though I was drinking a very thick soup. The fried intestines were crunchy on the outside and chewy on the inside. I’m not a fan of intestines, but if you are, you’ll enjoy this. I know Shum would – she loves innards, and I always pass my portion to her. The combination platter of char siew and siew yuk was extremely small, especially for the price tag it came with. That being said, the siew yuk was crispy, with a good ratio of melty fat and succulent meat. I thought the char siew was just alright; it was a bit too sweet for my liking. 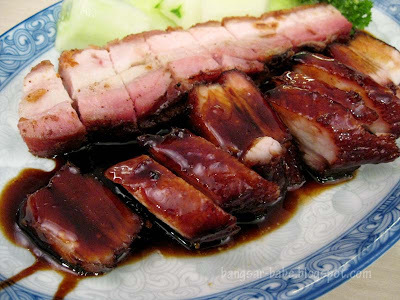 They should have given the sauce in a separate bowl, instead of pouring it all over the char siew. 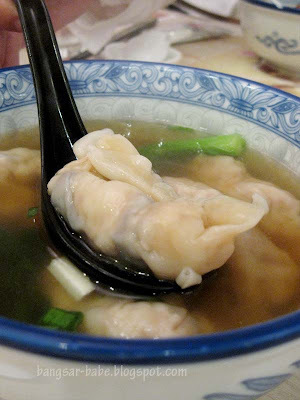 When the bowl of sui kows arrived at our table, I was surprised to see how huge they were. Each dumpling was full of prawns and minced pork. The prawns were fresh, sweet and crunchy; giving the plump sui kows a satisfying bite. 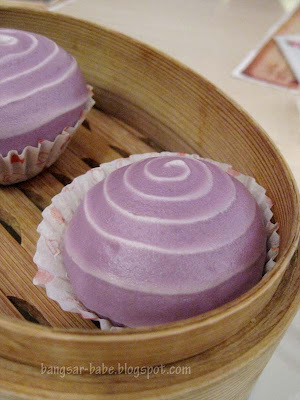 We ended our meal with some custard egg buns – they were tiny and had a pretty purplish-swirl. 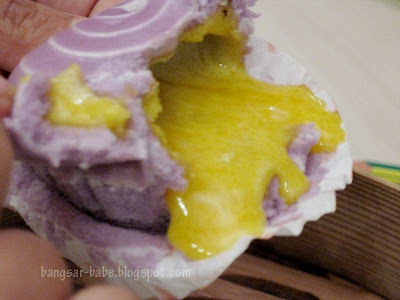 While the rest of the buns had a generous amount of egg yolk custard, mine was hollow. I told the waiter about this, and he simply took the bun from my hand, tore it open and POURED OUT the abysmally scarce filling onto my plate. My dining companions and I were startled, and found him extremely rude. He then said he’ll get me another bun, but I lost my mood for it after the hoo haa earlier. All in, I found the food mediocre and quite expensive for such tiny portions. 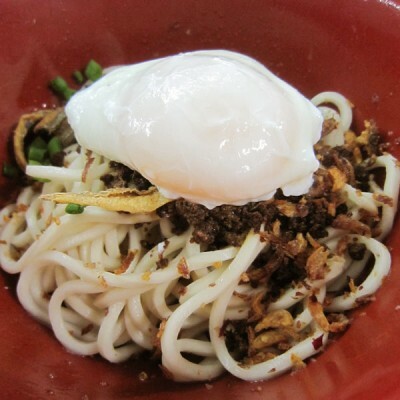 While the wantan noodles were nice, I still prefer the coffeeshop / old school noodles better. The one thing they were very generous with was the MSG. We all felt very thirsty after the meal, and asking the waiter for more water was harder than begging for money. Verdict: Come here only if you happen to be in a shopping mall and crave HK food. You may want to try Room Eighteen at Tropicana City Mall. Service aint that great but still bearable. Food it pretty good but the main thing is there is no MSG overdose. When ordering, say roast pork, you can specify that you want "pun fei sau" and they actually take not of it and it is shown in the printout of the items ordered (but in mandarin though). So if you don't get what you actually ordered, you actually have a basis to complain. I think its definitely a place to try out if you enjoy roast pork with crispy skin. The food can be had in coffee shop and cheaper and nicer, sans the good ambiance and lower expectation on service. Do you wanna do some advertorials (blog posts) ? I'm running a campaign for a telco company and they are looking for funny blogs – not too high traffic and so on. Do let me know if you're interested. Email me at [email protected] or sms 0193885548.
now lagi with your coomment..will head to other place better. he is so rude! omg. rokh – Maybe it's just my luck…because the service and food at 1U wasn't good either. Christine – Ya lor…terrible fella! taufulou – Hmmmm…you MIGHT get better service…who knows? worldwindows – Coffeeshop much better…and it won't cost more than RM10 per meal! Tee Lim – Thanks for the tip! Hi, accidentally saw your post bout Canton-i, The Gardens and I desperately want to support your point of view on bad service. I had my dinner today in that restaurant but end up very unhappy as the staff (called John Wong!!) treated me like a stupid from kampung and even worse by not looking at me while talking to me (am I invisible?). I just drop a complain email and wondering when will they response to my email. Haha! For me, no next time, not even other branches. I rather spend my money on good food and good service.